Get Your $85 Driver Helpful DOT Physical Exam at our clinic conveniently located in Colorado Springs, Colorado where we serve drivers and patients throughout Colorado Springs and the surrounding region. Need your CDL Physical Exam Today? We know your time is valuable! Same day appointments are routine. No waiting! Just give us a call at 719-344-8469. Easy to Find! Conveniently located off of Academy Blvd. Truck Parking Available! Convenient, easy access, truck parking right in front of the building! Worried About Passing Your CDL Physical Exam? Dr. Paterson knows how important it is that you continue your livelihood as a commercial driver. He has been in practice since 1998. With his extensive knowledge of the DOT Physical Exam medical guidelines, Dr. Paterson will steer you through the DOT Physical Exam requirements so you can Keep on Truckin’. Not sure if your medical condition will affect your driving status? Just give us a call before your appointment. We are here to answer your questions. Whether you are just traveling thru Colorado Springs or one of our local drivers, we are here for you! Looking for a DOT Physical Exam, CDL Physical Exam, or a School Bus Physical in Colorado Springs, Colorado? You’ve come to the right place! South of the Woodmen Road and Academy Blvd. intersection. Turn east onto Lehman Drive, take the second left onto Dominion Way. Parking entrance is the first left, or along the curb for larger trucks. Office is located within the Aspen Pointe Building. Daniel J. Paterson, DC is a Certified Medical Examiner in the National Registry and provides DOT/CDL medical exams, DOT/non-DOT drug and alcohol testing services and Sleep Apnea Testing. 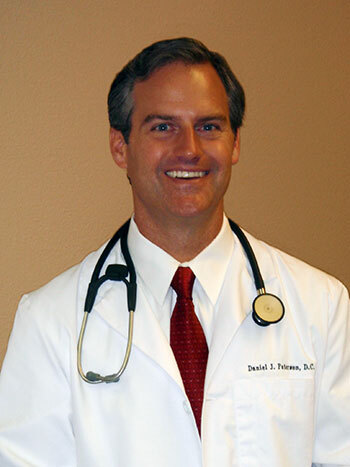 Dr. Daniel J. Paterson has been practicing chiropractic and integrative medicine since 1998 and is the clinical director of Premier Chiropractic Medicine. He has extensive experience in caring for spinal related issues. These range from trauma related cases as a result of accidents and sports injuries to scoliosis. This accompanied with his comprehensive post doctoral education allows Dr. Paterson to treat both simple and complicated cases. Dr. Paterson received his Bachelor of Science degree from The University of the State of New York. He graduated as a member of the Phi Chi Omega Chiropractic Honor Society with his Doctor of Chiropractic degree from New York Chiropractic College. Dr. Paterson is one of the first Chiropractors in Colorado Springs to hold the Advanced Practice Certified Doctor of Chiropractic credential. He is Board Certified in Traditional Chinese Acupuncture as well as having certification in Biomedical Acupuncture/Dry Needling. Dr. Paterson is a member of the Academy of Chiropractic, the American Association of Integrative Medicine, the American Chiropractic Association, the Colorado Chiropractic Society and the Colorado Spine Physician Association. These are national and state medical associations that provide the latest research on the diagnosis and treatment of spinal related conditions. This allows Dr. Paterson to offer the latest techniques based upon peer reviewed research when caring for patients, while also drawing from his years of practice experience. He is a Diplomate of the College of Clinical Nutrition and is Board Certified in Integrative Medicine. Dr. Paterson is supported by a caring, highly trained staff that is dedicated to meeting the needs of their patients in processing insurance, legal or work related documentation. He is a published author, public speaker and holds a license to practice Chiropractic Medicine in Colorado and New Mexico. He currently resides with his wife and two sons in Colorado Springs, CO.